Walled City is the new area control game from Mercury Games. Players act as Undertakers – the planners of the Northern Irish city of Derry/Londonderry. 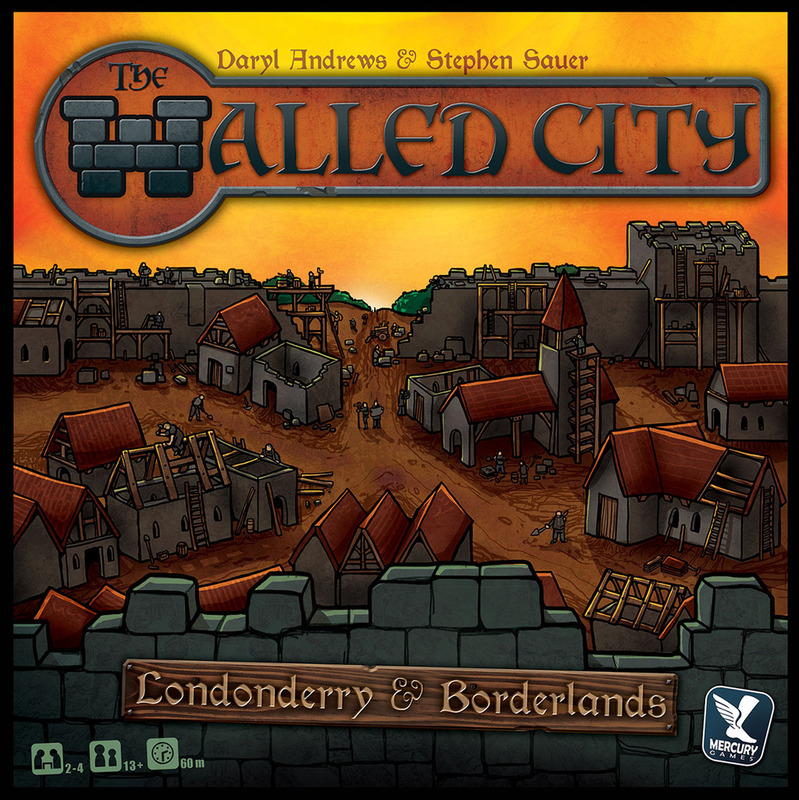 Note: I am aware that the name of the city itself can be a contentious issue, especially for those actually in and around Northern Ireland – for the remainder of this review, I will refer to city on the board as Londonderry – not as any sort of political statement but merely to stay consistent with the title on the cover. The game is played over two rounds, each of four phases. In each of the two rounds, you have a different goal. 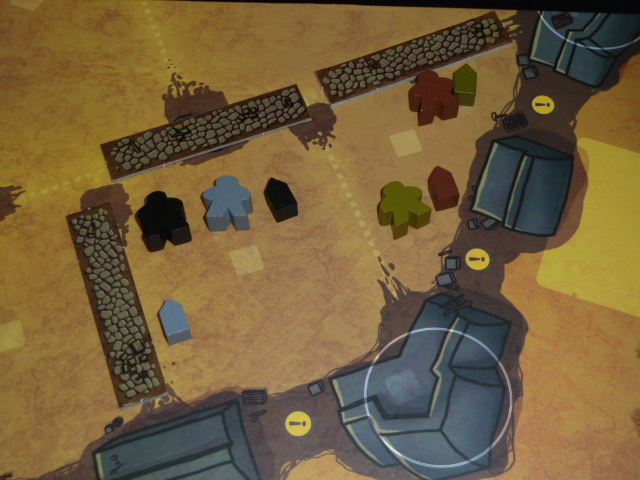 In the first round, players work on placing roads to break up the town into the different neighborhoods. In the second round, players now shift gears to work on building up the city walls and defense Towers. Scoring is mostly based on majorities in each round, though the scoring is slightly different. In the first round, the first thing to do is to align yourself with a Faction. 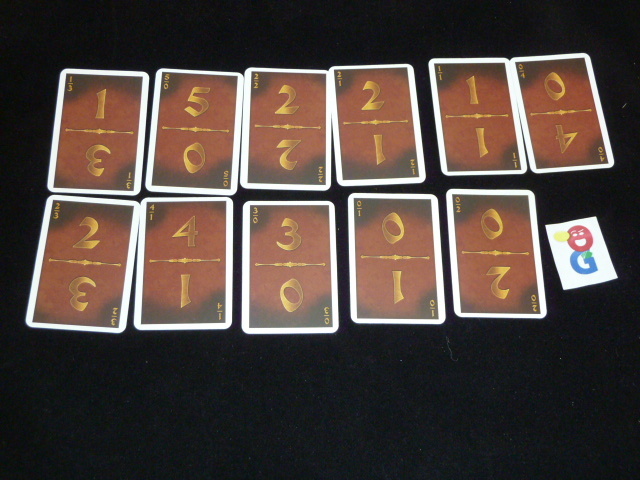 In setup, the Guild deck is shuffled (12 cards total) and 7/9 cards are displayed for 3/ 4 players. Each Guild has a special power as well as an initiative number. 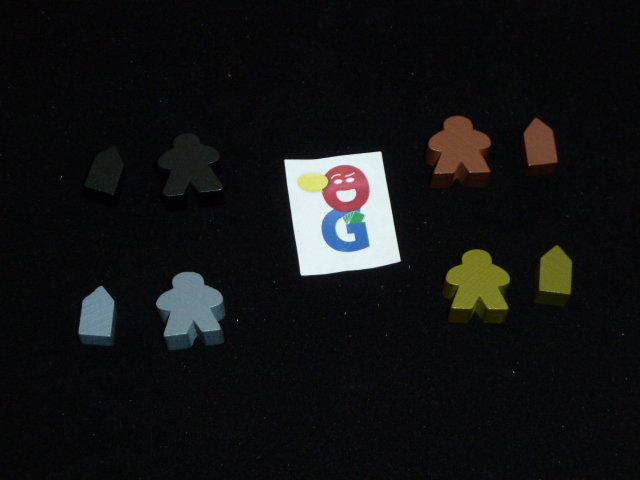 In clockwise order from the start player, players choose an available guild from the display and put it in front of them. They will be aligned with this Guild for the entire first round. Some guilds have special abilities that are always in effect while others have a one-time use which can be triggered at the discretion of the owner. The second phase is to build. 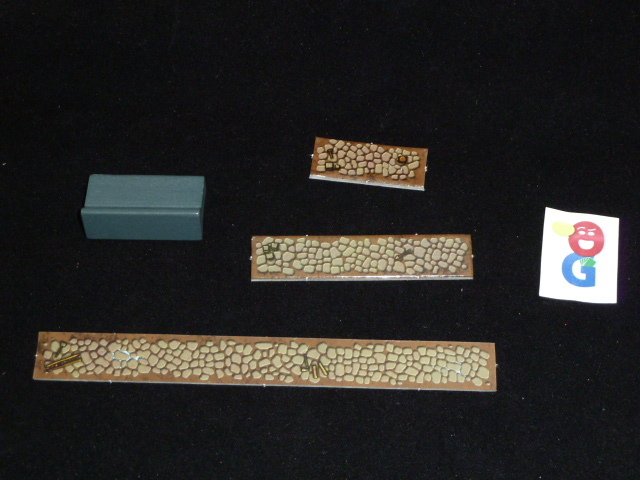 Each player is given 4 roads in setup, and in each turn, players will build one road segment to the board. 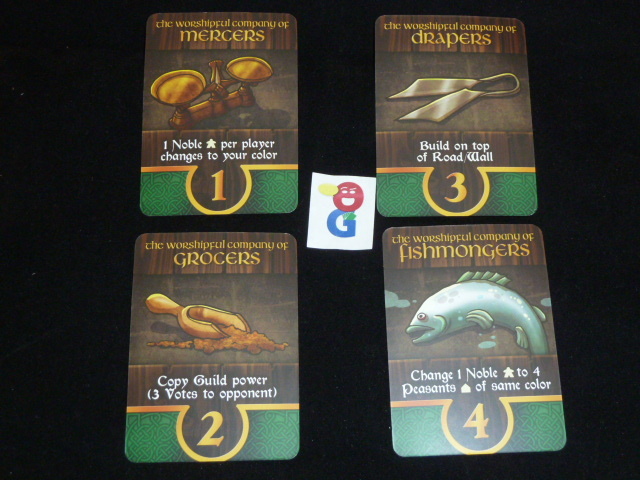 After placing a road, players must play one of the construction cards. Each player is given an identical deck of cards at the start of the game. There are numbers on these cards which tell you how you will settle some of your citizens. There are two types: Nobles and Peasants. The construction cards have numbers on either side of a line, and this arrangement tells you how many citizens you must place on each side of the road you just placed. You must exactly match the pattern on the card, though it is up to you to decide how many peasants and/or nobles you will place. Finally, before your turn ends, you get to adjust a faction die or flip a survey chit. On each area of the board, there is a randomly chosen die that is rolled and placed in that area. (There are also dice on the towers, but we ignore them in the first round.) The values range from 1 to 3. 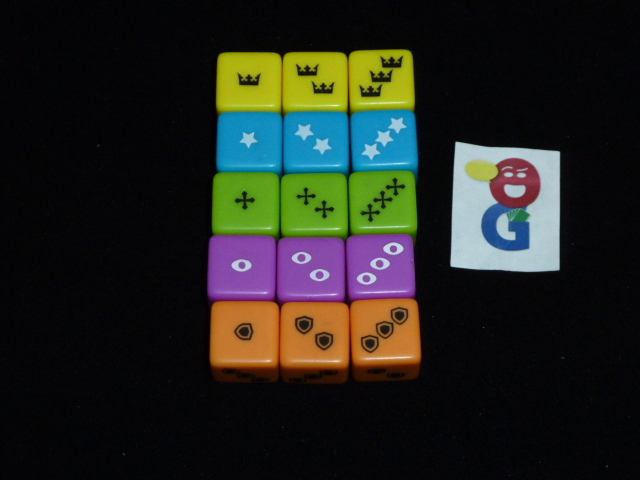 The four central areas have a survey chit instead of a die. You can adjust the value of any die adjacent to the road you placed by 1. If you want to modify a chit, you simply flip it over. Play continues in initiative order until everyone has played 4 roads, played 4 construction cards and placed citizens, and made 4 adjustments to the dice/chits. At the end of this phase, the city’s infrastructure will be complete. Neighborhoods will have formed – bounded by roads and the outside of the city. Not every possible road will be used – there are 19 spaces and only 15/16 roads played in a 3/ 4 player game, so some neighborhoods will be bigger than others. The third phase is the scoring phase. There are two types of scoring in the first round: Neighborhood scoring and then Faction Dice scoring. For each Neighborhood, you count up the number of citizens in each Neighborhood and award 5/3/2 Votes for most/2nd/3rd. For each Survey chit in the Neighborhood, alter all scores awarded by either +1/-1 based on what you see on the chit. If there is a tie, the player with the most Nobles breaks the tie. Go around the board until you have scored each Neighborhood. When you come to a larger Neighborhood, count carefully, but do not move the pieces out of the areas in which they were originally placed. The Faction Dice scoring is a bit trickier. Remember that each of the areas in the game had a die placed on them. There are five different colors of dice, and each one scores separately. (Again, we ignore all dice on towers at this point…) To score a color, you look at ALL of the neighborhoods which contain at least one die of the matching color. ALL of the citizens in those combined neighborhoods are totaled, and the player with the most citizens (Nobles again breaking ties) gets a number of votes equal to the total of all the pips of the dice of that color. All five colors are scored here. In the final phase of the first round, players work on the tower Defenses for the next round. Around the exterior of the city are ten card spaces. In reverse order of Votes, players choose one of their remaining Construction cards and place them facedown on an empty spot. The two numbers on the card will eventually each affect the tower that the number is closest to, but for the time being they remain facedown until the second scoring phase. That concludes the first of two rounds of the game. The second round is similar in format with the same 4 phases: 1) aligning with factions, 2) building – but this time with city walls, 3) scoring, 4) defense phase. There are some slight differences though which I will outline. The board pretty much remains in the same state as the end of the first round. In the first phase, all players discard their guild from the first round, and in reverse scoring order, they choose a new one from the ones still available. No new guilds are dealt out – you just have the ones which were not picked in the first round. Everything about the cards is the same – the one you choose is the card/power which you will have for the entire second round. In the Build phase, now the players are building portions of the City Wall. In a 4p game, each player gets 3 walls in setup, so this phase will last three turns; turn order is again decided by initiative number on the guild cards. Again, the first thing you do is to build a wall segment and then play a Construction card. You again get to settle Citizens in the ONE area that is adjacent to the wall you just built; so you get to choose either number from the card that you played. The other number on the card is used to Promote Nobles. Again from the area directly adjacent to your constructed wall, you can Promote Nobles to be Watchmen – these Nobles are now placed on either of the Towers next to your newly built wall segment. You do not need to promote the full number of Nobles, and you may choose Nobles of any colors to move to either Tower. Finally, you again adjust a faction die or survey chit in either the adjacent area or on one of the adjacent towers. Once all players have placed all their wall sections, placed Citizens, promoted Nobles and modified chits/dice, then the game moves into Scoring. But before you score, you have to let the unprotected Nobles run away. Similar to the roads, there are more wall spaces than walls. In a 4p game, two wall segments will not be built. In all neighborhoods that have at least one unfinished wall section, ALL nobles flee and are removed from the board. They will not take part in scoring. The first part of scoring is Neighborhood Scoring – this occurs just as in the first round – each Neighborhood scores 5/3/2 pts (again possibly modified by Survey chits). The Faction dice are also scored again, though scoring here is a little different because this scoring uses all the dice (both in neighborhoods and on Towers) as well as citizens in both Neighborhoods and Towers that contain those dice. The final phase is another round of Defense card scoring. Players place their final Construction card on an available card space on the periphery of the city. Again, orientation matters because the numbers will affect the Tower which is closest to that side of the card. Once all players have placed their cards, you score the Towers. Each tower is considered separately. The player with the most Watchmen on a tower scores Votes equal to the sum of the numbers on the sides of the cards closest to that tower. (An empty space is considered to have a 0/0 card there.) The player with the second most Watchmen on a tower scores points equal to the smaller of the two adjacent card numbers – this could be 0! (One of the adjacent cards could have a 0 printed on it OR an empty space is considered a 0). Once all the towers are scored, the game ends. The player with the most votes is the winner and will be the new mayor of the city. Ties go to the player with the lower initiative number on their current Guild card. My initial plays of Walled City have shown it to be an interesting take on the area control genre. I like the ways in which the different mechanics of the game weave together to form a multi-layered strategy. You are trying to both control the individual neighborhoods as well as the larger faction areas. Scoring is a bit higher for the faction dice, but this is also a riskier play because only the eventual winner gets the spoils. Placing the roads starts the whole process, as you can only place Citizens in the areas on either side of your road – you can watch an area evolve and make your decision on when you want to jump into an area; but if you wait too long, you might miss the chance entirely to influence things there. Furthermore, with each placement of Citizens, you can potentially change the scoring of the faction associated with that region – so you’re always having to recalculate what things are worth to you. As you play pieces in the first round, you should also be considering how they will score again in the second round. The scoring will be a bit different for the Neighborhoods as more pieces will be played, and Nobles can be promoted up to the towers. The Faction dice are also affected by the moving pieces, as well as consideration of the extra dice on the towers. The artwork is well done and thematic. The player colors are a bit non-traditional with army green, brown, gray and black as your choices. At first glance, it doesn’t look like there is a lot of distinction between the colors, but it turns out to not be a problem at all. The game can almost be viewed as two games in one. The board is double sided, with different board layouts on each side. There are some special rules that apply to the Borderlands side – meaning that you have two different, but related, games in the box. I have yet to even explore the other side of the game, though there are two pages of additional or modified rules in the rulebook. While it appears the overall structure of the game is similar, the strategies needed for each side of the board look to be different enough to provide an extra bit of gameplay with the box – but at this time, I really can’t comment on that as I haven’t played it yet! Perhaps there will be a First Impressions piece on the Borderlands board once I get it played.